A Microformat for grouping all your identities? Jesse comments on my Identity Burro post in which I spoke about OpenId as a possible method for tieing together various ids you have on social sites (flickr, del.icio.us, …). I want to be able to say that on flickr I’m phauly and on del.cio.us I’m paolomassa and on 43thing I’m mariah, etc. He ponders 2 solutions, a centralized and a decentralized one. I’m totally for the decentralized solution. I was suggesting OpenID but, to be sincere, I still need to interiorize well OpenID, I can feel it is a great idea but still need to understand all its power (and how to use it). Actually I think a microformat would be killer for this. Jesse says # Distributed solution – people can embed their information on their homepage, which can be mined by a greasemonkey script. If I want to know Paolo’s del.icio.us, flickr, 43thigns, … I need to visit his homepage and grab his list. I would add: they can embed this information … using a microformat and hence adding some simple semantics and a possibility to thousands of services to bloom! So according to the microformats process I’m going to send an email in the mailing list to see if there is interest, then we will Document current human behavior on the microformats wiki: are people already writing on their blogs which are their identities on social sites? Do they already do it using some formats? There are already formats for expressing your identities? And then I guess we’ll see what happen. I can hear someone asking “Attacks? Spamming?”. Yes, on my blog I can claim my identities are boingboing (blog), danah (photos), ethanzuckermann (URLs on del.icio.us), etc. But it is just as now I can open a blog on blogger and claim I’m bill gates or the pope. Or I can leave comments on anyone’s blog as Scoble writing “Microsoft is watching you”, no? Read “What about spam?” on OpenID.net homepage to get an idea. 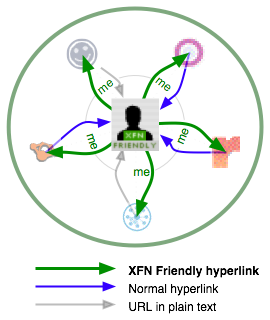 This entry was posted in Uncategorized and tagged Semantic web, Social Software on 31 August 2005 by paolo. You didn’t mention FOAF here, but it includes holdsAccount>OnlineAccount which does what you’re looking for. I use it in my FOAF file to show my accounts on del.icio.us and Webjay. Tantek ( http://tantek.com ) pointed to http://gmpg.org/xfn/and/#idconsolidation that is precisely what I was looking for. rel=”me” goes in one direction, to link from the service to your homepage, but then you want the FOAF file (or something similar) to point in the other direction out to all your accounts. shows that the links from my blog to the service are expected to be rel=”me” while the links from service to my blog can be plain URL or plain text.